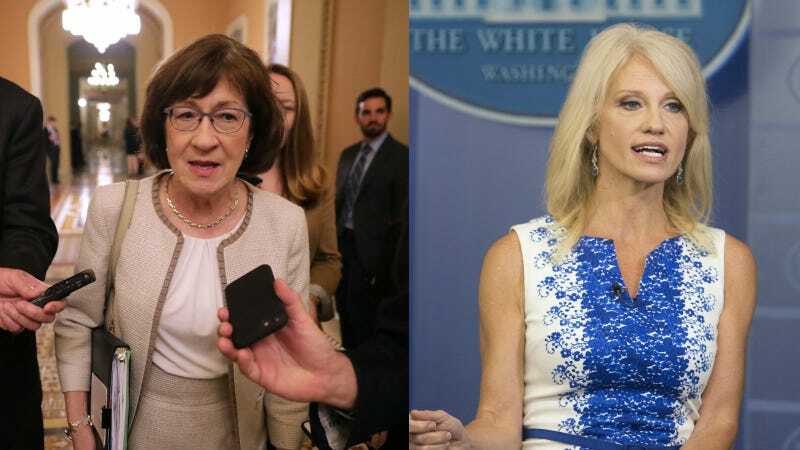 A day after the Senate voted to confirm Brett Kavanaugh to the Supreme Court, Senator Susan Collins and Kellyanne Conway doubled down on their terrible opinions, and in defending themselves, further established that Kavanaugh’s accuser Christine Ford and her most skeptical supporters were right: Her pain, in the end, didn’t matter. Collins, who earlier this week gave a long and condescending speech about why she would vote to confirm incoming Supreme Court Justice Brett Kavanaugh, went on Face the Nation with John Dickerson to reiterate the decision was incredibly difficult for her to make. Collins tries to look on the bright side, adding, “The one silver lining that I hope will come from this is that more women will press charges now when they are assaulted.” But Dickerson suggests Ford’s testimony—and the aftermath, i.e. Collins’ vote—could have the opposite effect and discourage women from reporting their assaults. Conway stood behind Kavanaugh on ABC’s This Week. She pinpointed a disturbing and distressing reality in America, which is that many women sympathize with Kavanaugh, in the face of Ford’s gut-wrenching testimony, because he reminds of them of men they know personally. It’s possible, but depressing to consider, that both Collins and Conway are right: More women may decide to press charges against their assailants, and the system and their communities will continue to side with men, even when presented with ample evidence of their wrongdoing.